On Sunday, 6-17-18, at 3:30 PM, deputies assigned to the City of Carpinteria responded to the intersection of Linden Avenue at Ninth Street for a vehicle collision involving two women being hit by a car. When Deputies arrived, they found two adult women, one with major injuries and another with moderate injuries. The women were identified as a 91-year old and a 50-year old, both from Carpinteria. 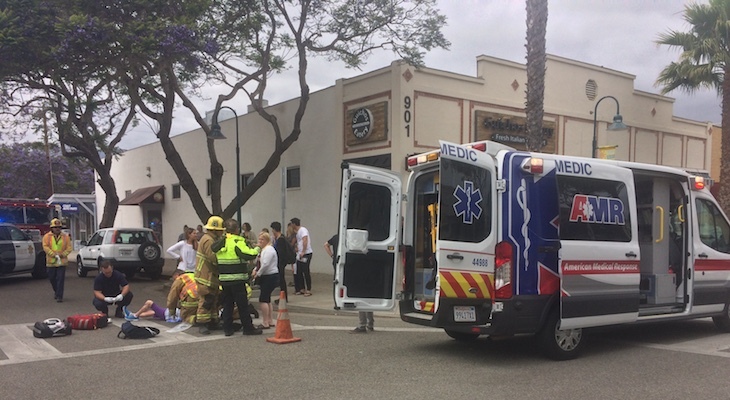 The Carpinteria Fire Department and American Medical Response responded to the scene and transported the women to Cottage Hospital for further treatment. Both of the women arrived to the hospital in stable condition. The driver of the vehicle was identified as 50-year old Stacielynn Sandrini from Bakersfield. Sandrini was arrested for felony driving under the influence of alcohol causing injuries. 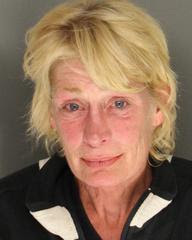 Sandrini was booked into the Santa Barbara County Jail on $100,000 bail. Due to the significant injuries sustained, Deputies from the Sheriff’s Major Accident Response Team responded to conduct the accident portion of the investigation. Good grief, that driver plows down a 91 year old woman who made it safely this far in her long life only to get run down by a drunk. My guess is she might be the one with major injuries; often pretty fragile at that age. Shame on all drunk drivers who know better but do it anyway. Sadly, by the time they're drunk, they often aren't able to think well enough to not drive. And, many will fight with anyone who tries to stop them, or tries to take away their keys. FYI: It's called a "No" symbol".... "The international prohibition sign, also known as a no symbol, no sign, circle-backslash symbol, nay, interdictory circle or universal no, is a red circle with a red diagonal line through it, completely enclosing a pictogram to indicate something is not permitted." People driving drunk often haven't been in a bar to do their drinking. So you are suggesting a punch card, perhaps, so you can't buy more than, say, 2 beers per day from the grocery store? Or are people only DUI after visiting a bar? -50 years old, looks significantly older -intoxicated to the point of running two people down with a car -at 330pm on a Sunday -from Bakersfield When Bakersfield sends its people, they're not sending the best. They're sending people that have lots of problems and they're bringing those problems. They're bringing drugs, they're bringing crime. They're drunk drivers, and some, I assume, are good people, but I read Edhat, and they're telling us what we're getting. We're going to build the wall, and the Bako's are going to pay for it. Bunch of drunk and dui drivers out today. Let’s not forget the realtor from Montecito, coming home from the wine fest, or some such, and hit’n’running a local psychiatrist. I’m pretty sure she got away with it with little more than a slap in the wrist, too. Horrible. "TUESDAY, SEPTEMBER 16, 2008 Judge reduces Hulsey sentence to probation BY COLBY FRAZIER DAILY SOUND STAFF WRITER Seven months after sentencing Heather Lea Hulsey to a six year, four month prison sentence for the hit-and-run death of a Montecito doctor, Superior Court Judge Frank Ochoa yesterday reduced the woman’s sentence to probation. The judge cited Hulsey’s pregnancy, a factor unknown to Ochoa at the woman’s February sentencing hearing, and her disqualification from a prison-operated program for inmates who give birth while incarcerated, as justification for his ruling." 6 years. TO START "Santa Barbara County Superior Court Judge Frank Ochoa sentenced the 21-year-old woman Monday to six years, four months in prison. The judge says he considered Hulsey's apparent lack of remorse. Investigators say Hulsey was reaching for her cell phone, which had dropped to the floor, when she struck Shlensky in July 2006. See what I mean about gullible readers and fake news? There was no forgery of signatures. Forms were pre-checked. A tiny little box was checked in advance 'coz it was a routine matter but Genis and Lance made a federal case out of it and with multiple episodes of liars poker in the Newspress the lies were swallowed hook line and sinker by the conspiracy loving public. You have to admit it's a strategy that is serving the current occupant of the big white house very well. You're pretty sure??? You don't know is what you're saying but "you're pretty sure"!! Put your prejudices aside for a sec and find out for sure. The only one who got away with DUI was NewsPress reporter Peter Lance because a 12 part series in McCaw's rag made the cop out to be the bad guy and the gullible readers ate the fake news up. Or Lois Capps' assistant who ran down Mallory Dies. At least he is rotting in prison someplace. You got that right Roger. Like that local chef who acted as if she didn't do a thing when she bashed in a car at State and La Cumbre, or the soap actress who done did worse. "Not my fault" is what the drunks say all the time....and the celebs are the worst. Big shock another drunk driver they never listen then they cry when they cause a horrible accident..I hope the victims survive.